Get ready for sand, sun and plenty of fun at the Silverstar Beach Festival from 11 to 20 December 2015, with delicious seafood, cocktails and beach activities perfect for the holiday season! It’s not every day that Joburg residents can enjoy the carefree beach feeling – soft sand between your toes, an excuse to wear a bikini in public, sipping cocktails while relaxing in the sun….but for a few special days this December, you can do just that as Silverstar Square is transformed into a tropical beach playground, with children’s activities by day and a beach paradise for adults by night. 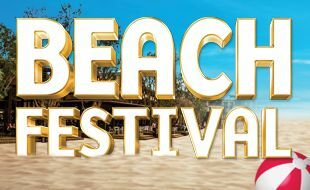 As part of the Beach Festival, a range of seafood specials will be on offer from restaurants on the Square, with Billy G doing a seafood paella, Publicity doing prawn baskets, seafood pizza from Vigour & Verve, as well as calamari, fish and chips, and more of your favourites. A beach bar will be available throughout the day and evening offering alcoholic and non-alcoholic slush. An extra treat is planned for the opening night of the Beach Festival, where you can join Charlize Berg and Jay as they lead you in sunset Christmas carols on the beach on Friday 11 December 2015,18h30 – 19h30.